We got to know her through her outstanding showing in the title role of Joseph Merrick, the Elephant Man, Laurent Petitgirard's contemporary opera. This production from Nice was released on DVD and is an obligatory buy. The opera itself is extraordinary, and Ms. Sýkorová's performance is simply fabulous. This attractive lady was unrecognizable under a heavy mask and costume (you'll hear from her how hard it was to sing in these conditions) but her voice was still able to shine through. An interesting fact is that Jana and Richard got married at the Karlstein Castle. Their daughter Kat'a was three years old, and she was the bride's maid! After immersing ourselves in the beautiful Czech countryside, on our way back to Prague we stopped by the couple's comfortable home, where Ms. Sýkorová treated us to a home-cooked gourmet lunch, featuring a delicious soup with dried wild mushrooms (boletus), followed by a very tasty turkey with local spices (the sauce was made of laurel or sweet bay, pimento, bay rum, and white wine), and a berry tart. The lunch was served with the good local white wine, and afterwards we sat in her well appointed living room for the interview. We were delighted with the friendly reception, and CountessAlmaviva said to Ms. Sýkorová that the experience was unforgettable. We have invited this nice couple to repay us a visit to our home in the United States, and we hope they'll make it. Mr. Kolár takes on the double role of husband and Ms. Sýkorová's manager through his agency RKM, and is the former deputy director of the Prague National Theatre Opera (built in 1883) after the so called Velvet Revolution, at the time when they made the Smetana Theatre (the Smetana originally was the famous Prague New German Theatre) independent from the National Theatre. The Smetana Theatre later resulted in the Prague State Opera, from 1992 to 1st January 2012, when the Prague National Theatre Opera merged with it - a move Mr. Kolár doesn't approve of, since the institution became more political and less artistic, according to him. Let us talk a bit about Ms. Sýkorová's carrer, before the interview. Czech contralto Jana Sýkorová, dubbed by a French reviewer "one of the most interesting Carmens throughout the world" has reprised this role in eight different productions. 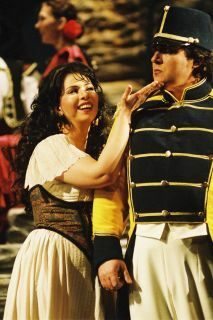 She made her 2007 debut as Maddalena with London Royal Opera House, Covent Garden (McVicar - Palumbo), where she returned to perform the role of Mercedes and to cover Carmen in 2008 (Zambello - Oren). As a soloist with the Prague State Opera since 1999, her repertoire has included title roles of Carmen, Orlando, Elephant Man and Death, as well as Ulrica, Olga, Ježibaba (the Witch in Rusalka), Maddalena, Suzuki, Fenena, and others. Jana Sýkorová has performed in concert in France, Great Britain, Italy, Germany, Norway, Denmark, Poland, Hungary, Slovakia and in Japan. Particular mention should be made of her performances in Brahms' Alto Rhapsody with Bernhard Klee in Denmark in 2009 and with Ingo Metzmacher in Prague in 2010; in Prokofiev's Alexander Nevsky with Gerd Albrecht in Germany in 2009; in Janácek’s Glagolitic Mass with Charles Dutoit and NHK Orchestra in Tokyo in 2009; and in Mahler's Symphony No 3 with Jakub Hruša and in Mahler's Symphony No 2 "Resurrection" with Tomáš Netopil in 2010. Jana Sýkorová's upcoming concerts will feature Dvorák's Stabat Mater, Beethoven’s Missa Solemnis and de Falla's El Amor Brujo. In addition to an extensive concert career she has recorded Dvorák's The Stubborn Lovers on Belohlávek's CD and several oratorios and song cycles for the Czech Broadcasting Authority. Her performances in the world stage premiere of Petitgirard's opera The Elephant Man in Prague and its French premiere with Nice Opera won international acclaim in 2002 as did the subsequently released DVD. Jana Sýkorová has been awarded many prizes, most notably the prestigious Europäischer Förderpreis für junge Künstler. OL - You were fascinating in your role of Merrick, the Elephant Man. How were you offered the role? It was courageous of you to accept; it is a very demanding and difficult role, isn't it? JS - I was not offered the role, in fact. It was Nathalie Stutzmann, the one who already had recorded the opera on CD under the baton of Laurent Petitgirard the year before, who was selected and already had a contract for the title role. The staging team was just looking for a cover in Prague. As a Prague State Opera Carmen, I was cast to cover Nathalie and to perform one of the last shows. What happened is that Nathalie stayed in Prague for just two days. After seeing the costume and the mask, she escaped! OL - [laughs] How difficult was it for you? Only to wear the mask and sing should have been quite a challenge for a singer... Can you tell us more about what went on during the production; what particular challenges you encountered? JS - You know, the whole staging team was from France. The pictures of costumes were arriving from France to be made in Prague. The French stage artists were still abroad, while the Prague artisans were working. We were supposed to have a lighter mask, but we ended up with one that covered my whole face [depicted above and on the DVD cover]. It was very difficult to sing in that thing. Once you wear it together with the body padding, you cannot get out of it until the end of the opera - as well as until the end of a four-hour rehearsal. I could not use the toilet. I was very hot in it, but couldn't even drink water. The mask was too heavy and pending to one side. While I was trying to keep my head upright I suffered from headaches and had to take medication to endure the pain. It was quite impossible to fully open my mouth and sing. The most moving scene of the opera, Merrick's death, was only rehearsed once, and I had a fever... I thought it was *my* death bed. But finis coronat opus. OL - On the DVD, you seemed exhausted after the performance, almost unwell. You didn’t smile during curtain calls. Your peers were kind of holding you up. What was going on, or going through your mind? Were you dehydrated? Or was it just the emotion of the role? JS - After each performance ended, I was always really exhausted both physically and mentally. I felt like crying both from emotion and from distress, and also from the feeling that I would have sung the role much better and my voice would have been much more beautiful if not loaded with a sandbag! My Prague appearance as Merrick in the world stage premiere was a surprise for all of us, and my French premiere in Nice was my first international engagement, you see? My peers knew how distressed I was, and I am thankful that they were holding me up. OL - What is your opinion of Dr. Treves? Laurent Petitgirard indicates that he was exploitative, in his essay that is included in the DVD. However reading a bit of the biography of the real Elephant Man, unlike what the composer says in his essay, from reading other sources it does look like Dr. Treves was actually a benefactor and helped the real Mr. Merrick quite a lot. So, while the opera character Elephant Man seems dismayed and frightened with the attention, in real life it does look like the patient appreciated being visited by noblemen and royalty. What side do you take in this controversy? 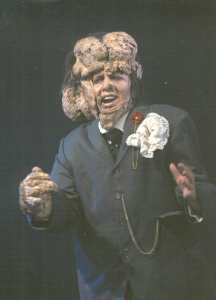 JS - I don't attach much importance to whether or not the real life of Joseph Merrick was different from how it is depicted in the opera. I fully respect how Laurent Petitgirard, his librettist Eric Nonn, and the stage director David Mesguich set up the role. I consider the opera as an independent work - independent from the movie by David Lynch and independent, probably, from the real life of Joseph Merrick. This really gets deep into the public. How do you read the psychology of your character? JS - I knew the story of Joseph Merrick from David Lynch's movie. I knew the character, I can sympathize with him and with his ordeal. As for the opera, it is the music above all that leads me to create the character - and the stage director as well, but the music is on top. 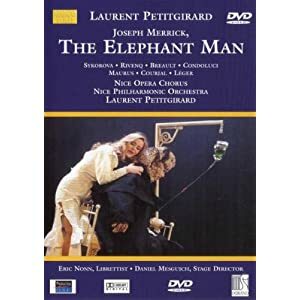 OL - We from Opera Lively think that Joseph Merrick dit Elephant Man is one of the best operas written in the last 25 years, and will grow in reputation, slowly but inevitably. What is your feeling about the future of this opera? JS - I share your opinion. I am proud to have participated in The Elephant Man. I wish the opera great success in the years to come. OL - Would you like to perform it again? JS - Yes, I would be delighted to sing it again. But I hope that the future interpreters of the Elephant Man, whoever they are, won't be limited in their voice performance by the mask. OL - What's your opinion of Nathalie Stutzmann's CD of the opera? And what about the version with a countertenor? JS - I appreciate Nathalie Stutzmann very highly. Her voice has a sumptuous color. I keep a collection of her recordings here in my living room. Her CD of The Elephant Man is excellent. A real contralto instrument like hers is a rare voice fach. I don't know the countertenor version, alas, but I can imagine that it must have been very interesting as well. OL - The Prague State Opera (in its different embodiments along the years) is quite an institution. You have been a regular for the last decade; please describe your experiences working there. JS - I am a patriot and a great admirer of the Prague State Opera. I started my career with the role of La Cieca in La Gioconda there; I've been a house soloist for all these years; it's my Alma Mater. I love it, that's all. OL - There is a great tradition of female Czech singers. We are well aware of great historical artists such as Emmy Destinn, Maria Jeritza, Jarmila Novotná, Ludmila Červinková, Marta Krásová, Milada Šubrtová, Maria Tauberová or Marie Podvalová. Do you feel part of this tradition? Do you listen to recordings from the past? JS - You have mentioned the greatest female singers of the past. I hold them in high esteem. I try to tread in their steps, but I still have a lot to do to get to where they were. OL - You have performed numerous roles in Carmen, Rigoletto, Nabucco, Madama Butterfly, The Devil and Kate, Orlando Furioso, Un Ballo in Maschera, Béatrice et Bénédict, etc. You had your debut with the Royal Opera House (Covent Garden) in the roles of Maddalena; and Mercedes in Carmen. You appeared in Die Walküre at the Wagner Festival Wels in 2000 and 2001. Can you tell us which of these performances are dear to your heart, and why? JS - I have loved all my roles. Actually I love singing Azucena and Charlotte. The most beloved role for me is Carmen which has been accompanying me from the first steps of my career. I have performed Carmen in eight different productions, and the role is a witness to my progress. OL - Your career has remained mostly focused on the Czech Republic. However the quality of your singing and the rarety of your voice type would have given you relatively easy access to the greatest houses in the world. Any reason why you seem to not have made a strong push to develop your career in a more international path? JS - I think that my hierarchy of values has changed a lot since I got my little daughter, who has started school last year. But I haven't said my last word yet! OL - How popular is opera in the Czech Republic? Do singers like you get recognized on the streets? JS - The position of opera in the Czech Republic nowadays is just like that of Cinderella at the beginning of the tale. Celebrities get recognized on the streets, but opera singers like me don't get celebrity status in the Czech Republic. OL - Opera is in crisis in Italy. Is it doing well in the Czech Republic? JS - Opera is in crisis in the Czech Republic as well. OL - What are the advantages and disadvantages of the Czech system of having in-house, resident artists who perform year after year with the same company? JS - Actually I am satisfied with this as I can stay home with my daughter. The system is common all over middle Europe, and in German opera houses as well, by the way. The disadvantage is that you have to ask permission from the Theater to be allowed to leave for guest performances and for concerts abroad. But normally, the Theater doesn't place any obstacles for my career. OL - And as a house singer, you have to take on any scheduled opera. Do you know already what you'll be singing next season? JS - This season has just ended last week. The new one only starts in September. We have a pretty good idea but it hasn't been officially announced yet and the casting is not complete, so we don't really know for sure. OL - So if it's a new role for you, you have rather a short time to prepare? JS - I have to keep the whole repertory up to date. OL - How many hours a day do you practice? JS - It depends. If I'm studying a new role or it's a new staging, then it's about four hours daily of rehearsals in the theater, and two hours daily of individual preparation. But if there are no rehearsals or it's a revival of one of our productions, I just practice for two hours a day to warm up my voice and maintain it for the roles. OL - Mr. Kolár, do you play the piano for her when she is studying at home? [Editor's note - Mr. Kolár used to play the piano]. RK - No, I stopped several years ago. I like to play, but I have no time. Now I keep myself busy with my management agency. If she needs an accompanist, she asks at the Opera Theater office and they provide one for her, then she goes to the theater and practices there. She can play the piano herself, but she prefers to have an accompanist from the Theater. OL - Ms. Sýkorová, can you please tell us more about your current work? What have you been doing or are about to do, and how satisfied are you with the current productions and concerts you've been performing in? JS - Last year I had the opportunity to step a bit out of the lyrical fach by performing Azucena and I'm happy to have sung this role. OL - Oh wow, Azucena is a very dramatic role but it also needs some balance with some lyricism. What is your take on this role? JS - Yes, it is true that it is more dramatic, but I think I still sing it in keeping with my fach. I'm not really a dramatic singer, so, I *can* perform a dramatic piece but I still perform it in a rather lyrical way, since I have to make do with what my instrument can deliver. OL - What else have you been doing? JS - This year I have performed the beautiful Mignon and I have returned to the Witch in Rusalka. The Prague State Opera production of Rusalka is a traditional one, told as a real fairy tale. OL - What do you think of stagings of Rusalka that do not present it as a fairy tale, but include elements such as making of Rusalka a prostitute or a victim of domestic abuse? JS - The most important thing for me is that the stage director should keep the meaning of the work. He or she can use modern costumes or update the story for a modern ambiance, but he or she must not change the sense of the work. OL - Are you interested in performing new, contemporary Czech opera? JS - Oh yes!. There was a recent premiere here in Prague of a new opera, in January, called Enchantia, by Marko Ivanovic. [Editor's note - Opera Lively has also interviewed Marko Ivanovic about his new opera - the interview is coming soon]. I did not participate in it, but I would have been very happy to do so. OL - Please describe for us the person Jana Sýkorová, beyond the opera singer. What do you like to do? JS - In the past, I loved to ride horses. My daughter is now in her first horse camp. I also like reading. But to define myself, I must say that actually I am a mom; I spend as much time as possible with my little daughter Kat'a [Editor's note - we saw pictures of the little girl around the house, and her artwork - she is very cute!]. OL - Would you like your daughter to be an opera singer? JS - No, not at all, it's too hard a lifestyle. OL - But do you expose your daughter to opera? Does she realize that her mom is an opera singer? Does she love it? JS - Our daughter loves opera. She is living opera with us. She used to attend mom's performances since she was two years old. I do take her abroad with me whenever possible. For instance in London forCarmen, the preparation was very hard so we left my daughter with her grandmother for the rehearsals, but after the opening night we came back to pick her up, and we spent the entire month of the run in London together, and she attended every performance. She stayed behind the curtains (laughs) which was quite amazing because the production had a horse and some chickens (laughs); you can meet them backstage, and it was quite interesting for Kat'a. Escamillo, sung by bass-baritone Kyle Ketelson, entered the stage riding a horse. Otherwise, Kat'a used to attend all my performances in Prague - she has never missed any of them that happened on Fridays and Saturdays, since she wouldn't have school the day after. We even used to organize group visits to the opera, with some of her schoolmates. OL - What are your plans for when your singing career comes to an end? JS - Maestro Gerd Albrecht with whom I recorded Dvorak's oratorio St. Ludmila on DVD said once to me after having lunch in our house: "As your career comes to an end, use your culinary artistry!" OL - Well, we can fully confirm what he said; your cooking is terrific! Thank you so much for your hospitality; we're embarrassed with all the trouble you went through to receive us. JS and husband Richard Kolár - It was our pleasure. We are proud of our culture and the beautiful art we have here in the Czech Republic, so we are very happy when we have an opportunity to show a bit of it to visitors. Very candid and refreshing answers!. It's clear Ms. Sykorova *hated* that mask. But her performance as Merrick was great, nonetheless. Very nice interview, Alma; sounds as though it was a pleasure to obtain it! Yes, Schigolch, after the interview was over and we kept chatting, she said she hated the mask with a passion! Her husband added, "Jana hated it, hated hated hated it!!!" And she kept saying that she would like to record it properly on studio because she is sure her voice would have been a lot better. We kept saying to her - "but it was extraordinary anyway!!!" @Soave: You bet! It was likely the most entertaining interview we've had so far, enjoying the artist's hospitality and her outstanding culinary artistry. That meal was so, so delicious!!! And she is a wonderful person, and her husband is an extremely nice guy. We were highly impressed! Jana and her husband sent us two beautiful photos of their wedding and their child, and allowed us to include them here, so, check them out!